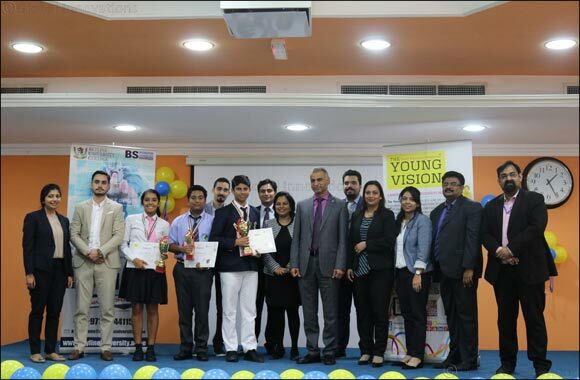 Dubai, UAE, May 08, 2018: Skyline University College in collaboration with The Young Vision magazine organized the first Inter-School 12th Coder Challenge 2018 on April 30, 2018 at SUC Campus. The competition which served as a platform for young talents to showcase their skills in the field of software development has registered more than 180 participants from various schools in the UAE. Three top coders bagged the awards namely: Tejas Goel of Delhi Private School, Dubai (Winner); Ananya Pratap Rao of GEMS Modern Academy (1st Runner Up) and; Harsh Doddannavar of JSS International School (2nd Runner Up). The Chief Guests of the competition were Consulate General of India-Dubai Consul General, H.E. Shri Vipul and SUC Founder President, Mr. Kamal Puri who awarded the winners with trophies and exclusive SUC scholarships. The esteemed line of judges of the competition were: Mr. Sunakshi Sharma, Senior Software Engineer of TASC Outsourcing; Ms. Pooja Trivedi, Senior Software Engineer of TASC Outsourcing; Mr. Mohamed Jawad, Associate Vice President-Technology Division of TASC Outsourcing; Mr. Mohamed Amine Belarbi, Co-Founder VUL 9 Security Solutions and; Mr. Mohamed Zakarie Al Khdime, Co-Founder of VUL 9 Security Solutions. The Inter-School 12th Coder Challenge will be an annual event organized by Skyline University College.